The life of a Speedway and Grasstrack rider is a hectic one, and throw World Longtrack into the mix you can see why James Shanes, our new Feature rider for 2019 is building up for a busy one. Dirt Hub: It’s been a long winter so what have you been up to? James: Not a lot really. After a long season I spent a bit of time trying to unwind, and since then I have been rebuilding bikes, keeping fit, and I have also been working on getting my HGV license as well. Its been quite hectic getting everything ready and turned around, but last week I got my bikes finished, and I picked up a new van from Owen Brothers, so next week’s job is to get that all kitted out ready for the new season. DH: Have you got your 2019 speedway teams sorted out? James: Yeah I have signed for Birmingham, and it’s great to be going back with them moving up a league. I have been named as captain which is quite an honour, and I wasn’t expecting it, being the least experienced and youngest rider in the team. I am also with Swindon again this year which is nice to be racing in the top league, after having a year out from it, so I look forward to reasserting myself as a top league rider. DH: So the bikes might be ready, but it must be a massive task of organising all of your fixtures in the calendar? James: That can be headache, and we have had countless conversations of how we are going to get me and the bikes from A to B, and how to get everything ready to do something different. It has been a headache, but we are slowly starting to sort it all out. DH: On the World Longtrack Championship front what are your goals for the season? James: Well last year I finished 5th which I was disappointed with. I had too many bad rounds. At La Réole, I had a suspected broken ankle, then… I had a damaged knee, so I didn’t have the best of luck with injuries in the World Longtrack series. I still got on the podium at one of the rounds; I need to get that consistency, without injury and engine problems. I just need to cool down and get the consistency that I had the year before, so hopefully, we can get on the box this year. DH: You missed out last year on winning the European Grasstrack Championships, that must be a big goal for you in 2019? James: It was a big shame I didn’t win it last year. If I had of won it I would have been one of the only riders to have won it three years in a row, which would have been a great achievement but I still managed fourth, but this year we will be going for the title again. 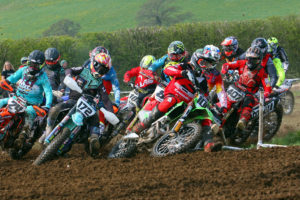 DH: What are your plans in terms of racing Grasstrack in the UK this year? James: I will be racing at Ledbury in April, and I will be trying to get in as many meetings as I can. Obviously, my schedule is quite full up, but if I get a weekend off where I can ride Grasstack in the UK I will, but at the same time, I need to try not to overdo it with too many meetings so I can keep myself fresh for the end of the year. James: Yeah that’s quite a cool thing. I have ridden a couple of floodlit meetings in England. The last one I rode was at High Easter, and that was really good. It will be interesting to see how they run it, and at the moment my schedule for then seems to be free, so if all goes to plan, I will hopefully be there and riding. DH: Have you made any changes to your equipment or set up this year? James: No not really apart from a change in colour scheme to keep it fresh. Myself and Roger Taylor at RTS keep developing the frame, and along with Jawa and Tornado we have worked on a new head over the winter, and other bits in the engine so we can keep progressing forward and find a bit extra horsepower. DH: What about yourself physically, have you stepped up your training? James: Physically not much really, I have been keeping fit, and have been back running, which is great after a couple of years out with my knee problems and things. So yeah I have just been keeping fit and not eating rubbish. DH: Is your Dad back as chief mechanic? James: Yeah Dad’s on board, and hopefully, I will have Henning Loof back for the speedway, and Danny Warwick will be helping out too where the schedule gets packed. I can’t expect Dad to do them all. So I think I have a good team behind me, a team of mechanics and a team of drivers to chauffeur me around. It’s looking promising this year, and I have a great feeling after Preseason practice over the last few weeks, so I am ready to hit the season full bore. DH: When is the first race meeting of your season? James: On Speedway its the 3rd of April with Birmingham and on the Grasstrack it will be the Ledbury Leader on the 14th April. DH: Any new sponsors on board for this year? James: Yeah quite a few actually. Its been a really good year sponsor-wise. I am very thankful to welcome onboard Daytona Boots, Venhill, Clean My Ride, and Floodmate as well as all of the sponsors I had with me last year which is absolutely amazing. Its really down to all of my sponsors and everyone behind the scenes who keep me on track, doing what I am doing, and I would like to thank them all. We will be following James throughout the season so keep your eyes peeled for updates.